This morning I had breakfast with my friend and marketing colleague Stan Phelps, Chief Solutions Officer at Synergy Events. Stan and I were talking about The Purple Goldfish Project, an almost two-year book venture of his that he’s trying to wrap up for an early January publishing date. 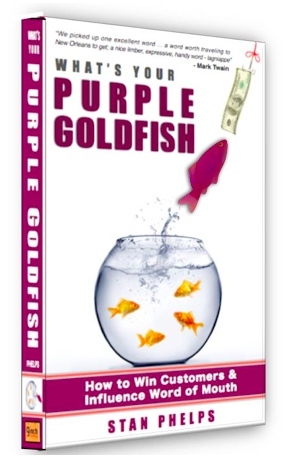 For the book, he’s compiling 1,001 examples of marketing lagniappe, which he terms Purple Goldfish. A Purple Goldfish is when a company “gives little unexpected extras” (G.L.U.E.) as added value. It’s Purple Goldfish that become the stuff of positive word of mouth. Some years ago I went to get into my car in my parking garage to find it had been hit. A Good Samaritan had left a note on a scrap of paper on the windshield saying they’d witnessed the hit and run. They gave me the make, model, color and license plate number of the car. I duly made a police report and informed my insurance company of many years, State Farm. The representative I spoke with obtained the police report and ok’d my claim less my $500 deductible, which I paid. Several months later I received a call from State Farm’s investigations department asking if I had any documentation about the incident other than the police report. I had kept the original windshield note in my accident file and faxed a copy. WOW!! If that’s not a Purple Goldfish, I don’t know what is! I can’t tell you how many times I’ve told this story over the years. The positive word of mouth has, I’m sure, gotten State Farm far more than the $500 that I never would have known about, were it not for their proactive, honest customer relationship building – not to mention their persistence. If you have any Purple Goldfish tales, please share them in the comments and I’ll pass them along to Stan. You can follow his progress and acquire the book when it’s published at www.purplegoldfish.com.